The Defense Health Information Technology Symposium (DHITS) opened today at the Caribe Royale Hotel and Convention Center, Orlando. The Defense Health Agency (DHA) is a joint integrated Combat Support Agency that enables the Army, Navy, and Air Force medical services to provide a medically ready force and ready medical force to Combatant Commands in both peacetime and wartime. We are happy to report crowded aisles and steady traffic at the NCS booth, #608, where Joe Guest, Matt Cooke and Linda Letosky are on hand. 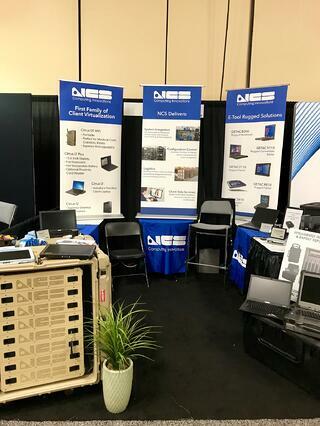 NCS is promoting much of its solutions portfolio, including end-to-end virtual networking, Getac rugged PCs and servers, medical carts, and rugged cabinets. So far, much of the booth activity has centered on understanding how best to jump into VDI, or virtualizing the desktop. NCS VDI solutions all are focused on improving manageability, driving down cost of ownership and improving security. For many IT administrators, virtualizing the desktop means making an immediate choice: thin client or zero client. A thin client is a PC with a very small capacity hard drive and minimal local memory. A thin client retains some kind of OS, such as Windows Embedded™ or a customized Linus OS. Administrators hope that thin clients will be easier to administer and be lower in cost than traditional PCs. The reality is that by retaining a small OS, however, thin clients may remain more vulnerable to security exploitation and actually add to complexity of IT adminstration. For those that do the research, IT managers find that zero clients offer the most secure and easy-to-administer virtual desktop infrastructure (VDI) option available. Zero clients are the next generation of desktop VDI. A zero client has no local OS. The operating system resides in the data center. Therefore, there is no persistent user data, no patches, updates or antivirus software needed. We encourage you to stop by the symposium this week to learn more about NCS zero clients, our Getac rugged offerings and our other defense health-related solutions. To learn more about NCS zero clients solutions right now, just download our brochure.